Pool tables are a very expensive piece of game room equipment. Not only are they used for a business game room, but many residential homeowners have pool tables in their game rooms at their homes. When you are relocating your home or business these pool tables must be moved. Inexperienced movers can cause severe damage to these pool tables making them become off balance during the moving process. You never want this to happen to you because it can be really expensive to have the pool table repaired if damaged or if it becomes off balance. Our company has experienced and professional pool table movers who ca transport your pool table to the destination without ever harming or damaging it. Our professionals are experienced in moving a pool table without taking it apart. That is right, your pool table can arrive at your new destination all in one piece. This will save you much valuable time indeed. We have a highly advanced pool table moving dolly that will help our movers complete the job. If you are planning a move and have a pool table, then you hjave come to the best place for useful information. You may contact our licensed and insured moving company to get the quote on pool table moving cost. 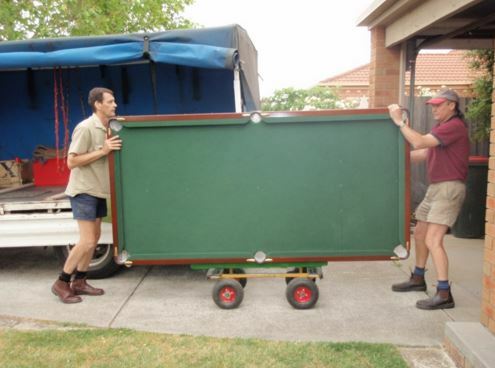 Our moving experts use pool table moving equipment that has been specially designed for moving pool tables only. We can move pool tables of all sizes, shapes, and designs to any destination. Our long distance movers are prepared for your move and the pool table moving as well. If you are wondering how much do movers cost, then just contact us by filling out our online short form or give us a call for a free consultation. Our moving company has u-haul of all sizes to help us complete moving jobs fast and efficently. Pool table moving prices may differ depending upon a number of factors like oxze, the disatsance irt wqill be moving, sand more. Some moving companies are not equipped for moving pool tables. Our company moving team has been trained and are equipped with the proper pool table moving equipment. We can move your pool table and transport it safety. It is all guaranteed. Our reps can schedule a free consultation with you to discuss a variety of pool table moving options. You may inquire if your pool table can be added to your moving and packing package. A guaranteed complete moving and packing deal is what you will get when you choose our professional movers. All for one nice low price and you will not be able to find another moving company like us with so much knowledge and experience, plus advanced moving equipment in moving just about anything. Contact us today to make plans moving your pool table safely without taking it apart.